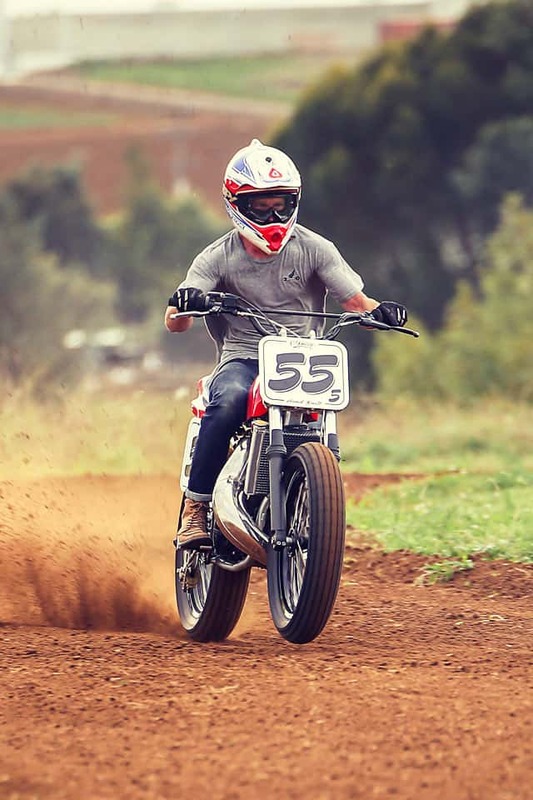 I have always loved Dirt bikes as a kid, my brother mick still races when he can on his machine and I saw these photos today and had to blog about it as this is one of the Old School “Power houses ” of Muscle from back in the day. 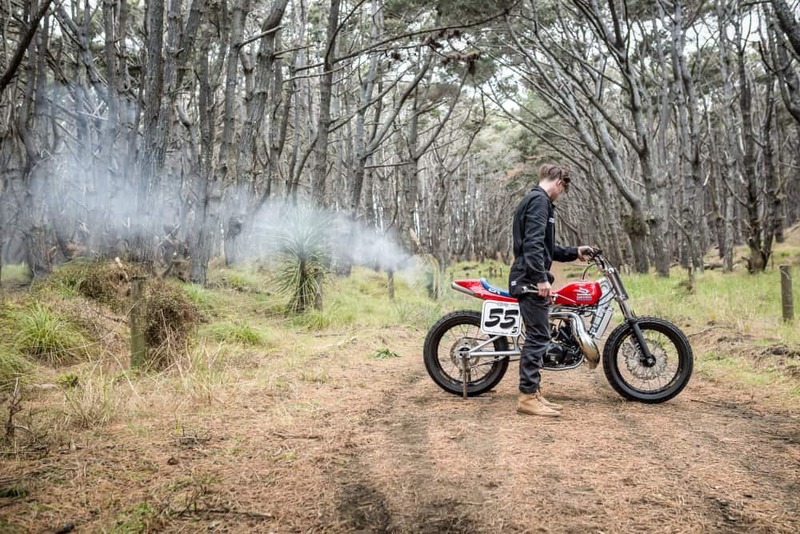 The 1985 CR500 you see here has taken on a New guise and better for it too, as I have loved the Flat Track style of Motorcycle and it took a cool Kiwi ” Adam Hedges & Earnest Co. to come out with this Killer Diller of a machine. 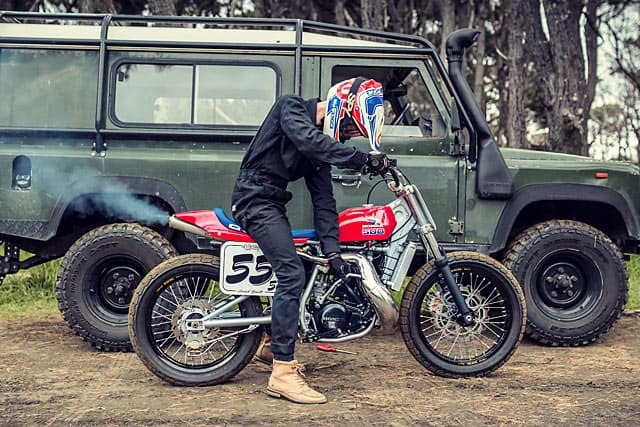 New Zealand builds Great cars and bikes and here is proof of Just that. 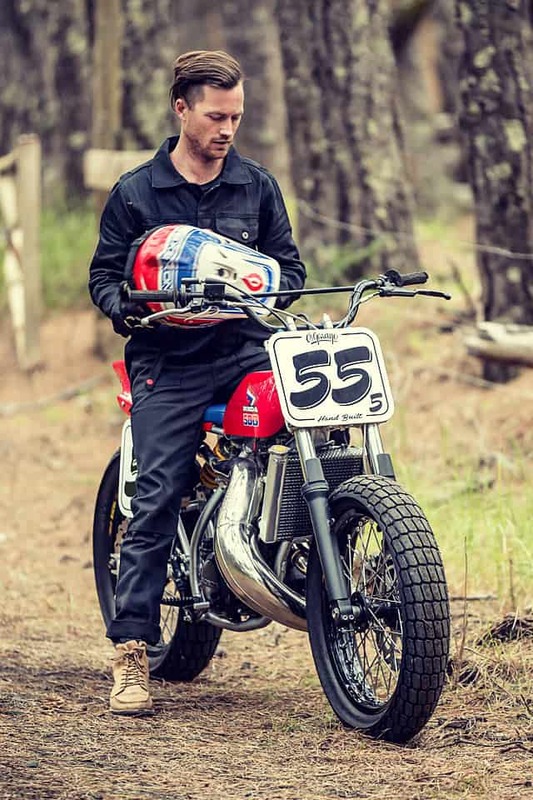 Adam hedges used to be a pro Drift racer and it seemed only natural to incorporate something into a Drifting motorcycle, so with some loot in his Hand, Adam tracked down a 1985 CR500 right from here in Southern California and shipped it back to the other side of the globe. With his C’s Garage drift shop, he’s teamed up with his brother at Earnest Co. to try his hand at a custom tracker build. And what a build it is, it just screams Speed right from the gate. 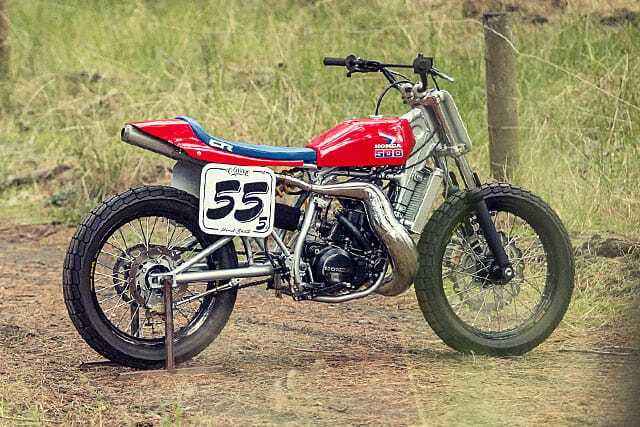 I can so relate to these bikes as this was Me and my brothers era when it came to ultimate Moto X machines and I was in awe of this beast when my Eyes came across these photos via Pipe Burn. will, pull your arms off, a works 250 is slow when compaired to these bikes. rideability of the bike especially in technical areas or woods. When you get it jetted correctly the bike is very crisp off of idle and has incredible low to mid-range power and then flattens out on top. 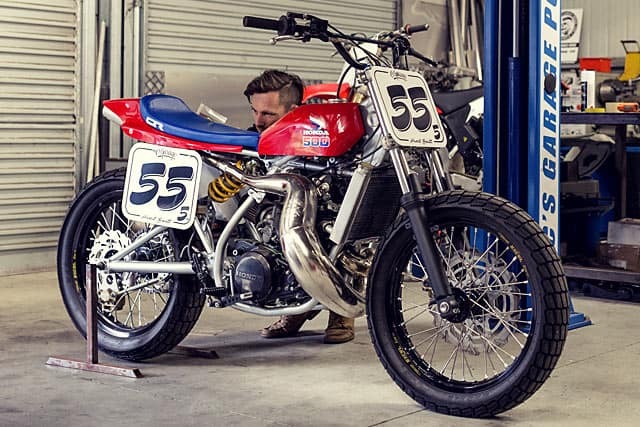 So to see this machine now transformed into a Flat tracker is mind boggling, putting all that grunt into the back wheel is something only a rider who has sampled its brutal power. I am testament to this, riding my brothers and, in front of him and our mates, they all watched that CR500 spit me off like I was a Tick on a Bull and then to rub the proverbial Dirt in my face, the CR500 has the audacity to land on me and pummel my body a wee bit more. 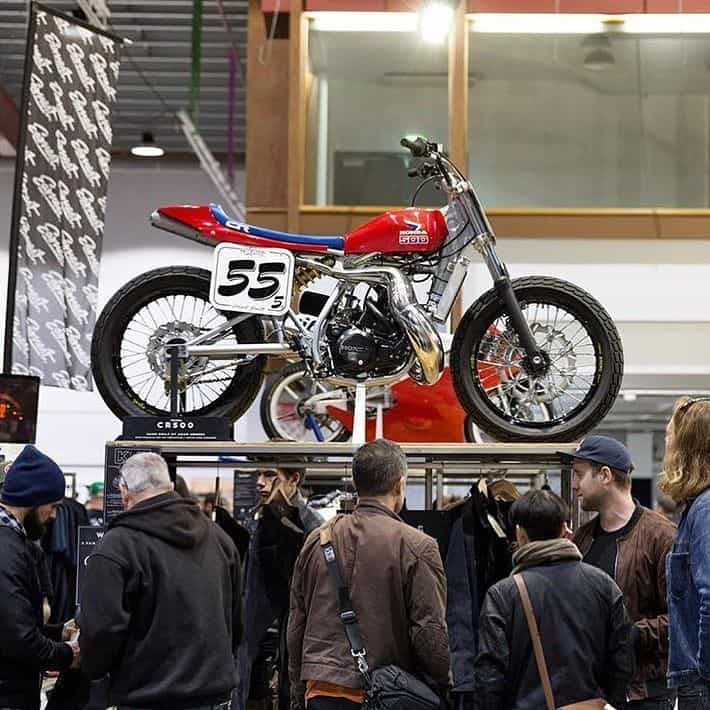 So I literally have no idea how this 2 stroke Behemoth will react when you hit the loud button on a bend, all i can say is grit your teeth and hold the hell on as this will be a ride you will never forget. Adam has already built a couple of CR250’s as well, being that he was a fabricator of Drift race cars for a decade, seems a natural cross over to incorporate his skill into Two wheeled machines and if I had a hat on, I would tip it your way Adam. 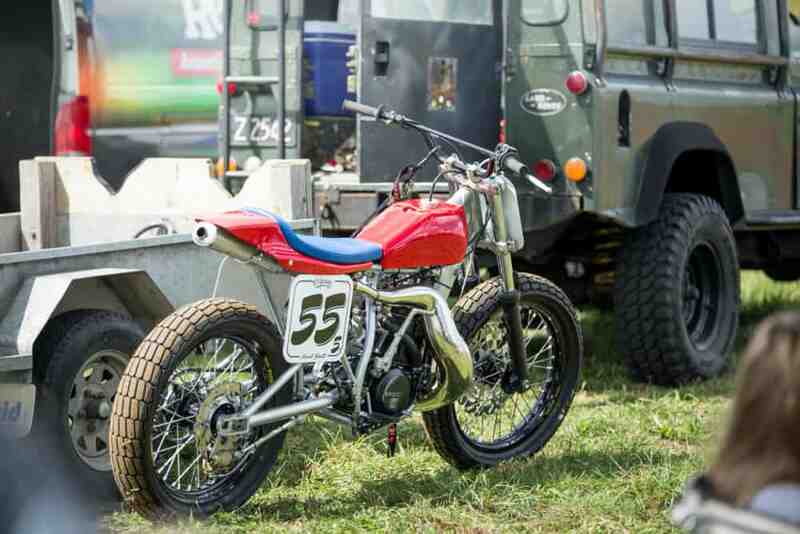 Adam wanted to build this CR500 with a style that Honda would of maybe would of produced at that time if they had known the following it would produce and this is such a great job and it does look like a Factory HONDA Race machine. Adam fabricated a shorter swing arm made from chromoly and fitted a Ducati rear shock to keep your Arse from being beaten up as its a softer compression, the only stock parts from this machine really, is the frame and the Engine. 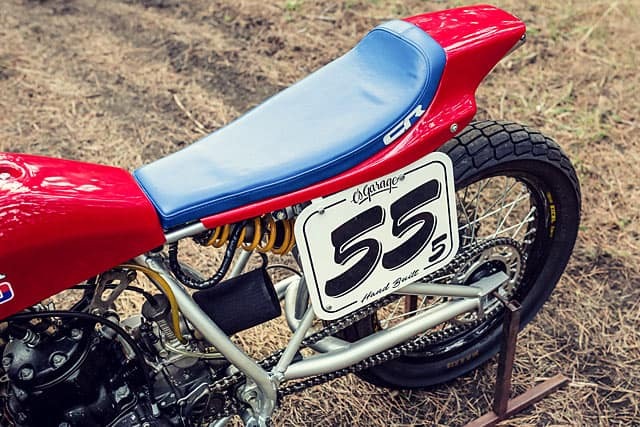 This has an XR750 Glass fibre tail section to give that Yester Year look and to add to that a Champion gas tank was purchased, these were all the rage and made back home in The UK and flat tracker love them. Adam kept most of the FMF Expansion chamber but added a mid piece and then rejoined to FMF rear and cleverly exits under the rear seat cowl. 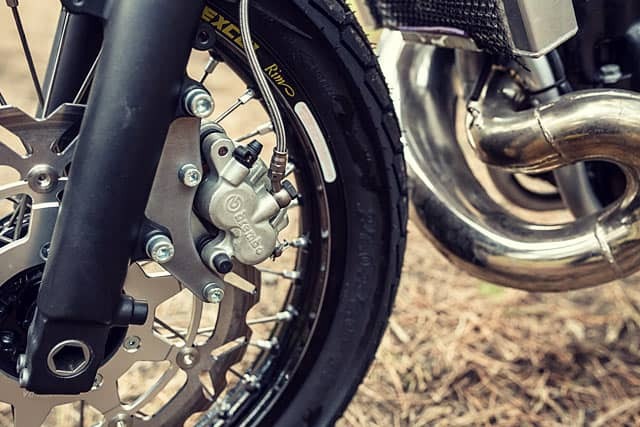 The front end is handled by a set of 2004 R6 Yamaha Forks, coupled up with a nice brembo that was removed from a KTM, the Rear caliper is off a Ducati Monster, so no problem on braking power now. 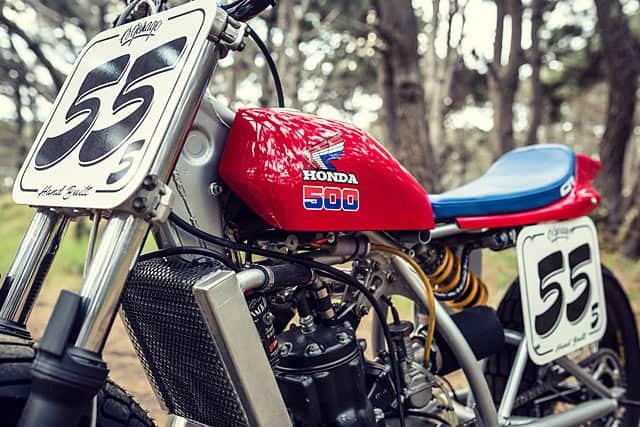 The Original CR500 was a drum rear, so a master cylinder from a later CRF was located and then Adam fabricated all the mounts to make sure that this set up function was right on the money. With its RED ROCKET color schem this bike is a Home run for me, Id love to build one but CR500 machines are now highly sought after and I only have to think about 1986 when I got a severe thrashing from such a machine, maybe its best I do not attempt it on such a power house platform, albeit still build one but with a controllable engine that I can handle. 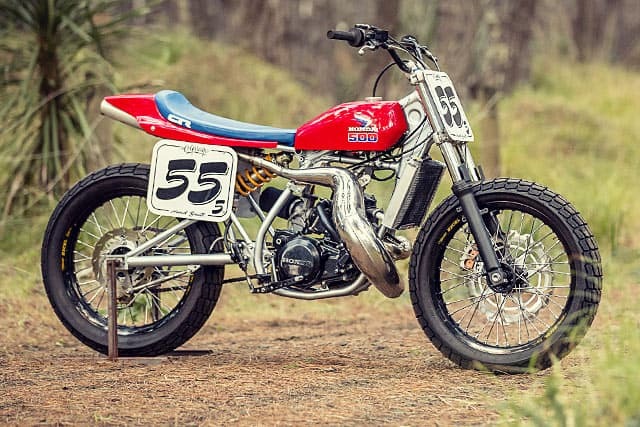 This entry was posted in Blog and tagged 2 stroke, CR500, Elsinore, graham noyce, hand built, Honda, motox dirt bikes, power house, red rocket, tracker.